American design and manufacturing at its best. Trail LED DS has 5 laterally mounted LEDs for a good horizontal beam (click to enlarge). Trail LED certainly upped their game by exceeding Lumen claims and delivering a staggering 3150 Lumens against a claimed 3200. They also developed an elegant new mount that holds the finned light head on the the bar securely. Quality and usability is still top notch as the head unit displays the finest machining we’ve ever seen in a light. The notches for the rubber mounting straps are making a lot of sense to us now in terms of their simplicity. 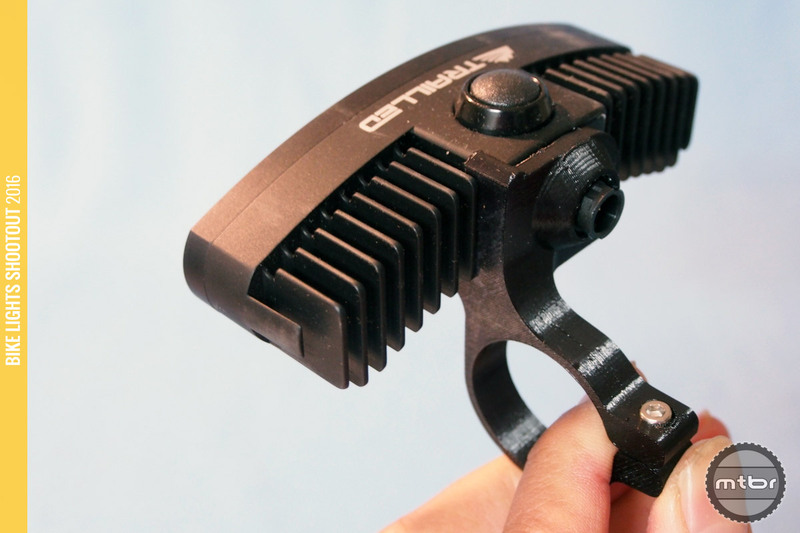 The light can be used the helmet with its 108 gram head or mounted on the bars. Trail LED DS with new bar mount (click to enlarge). One of the coolest things about this light is the form factor. It is not round or square, rather it’s a horizontal array of lights. This allows it to have the ideal wide beam pattern with a high center. It also allows room for plenty of cooling fins. This DS model is the workhorse of the line and achieves the happy medium between compact and exotic. For bar mounting, there is a new mount that efficiently holds the fancy lighthead on the bars securely. Charging is done by a huge external charger that will fully charge this powerful battery in two hours. The battery is now nicely padded and encased in a shock absorbing pouch to help protect it. Trail LED DS is all made in Texas (click to enlarge). 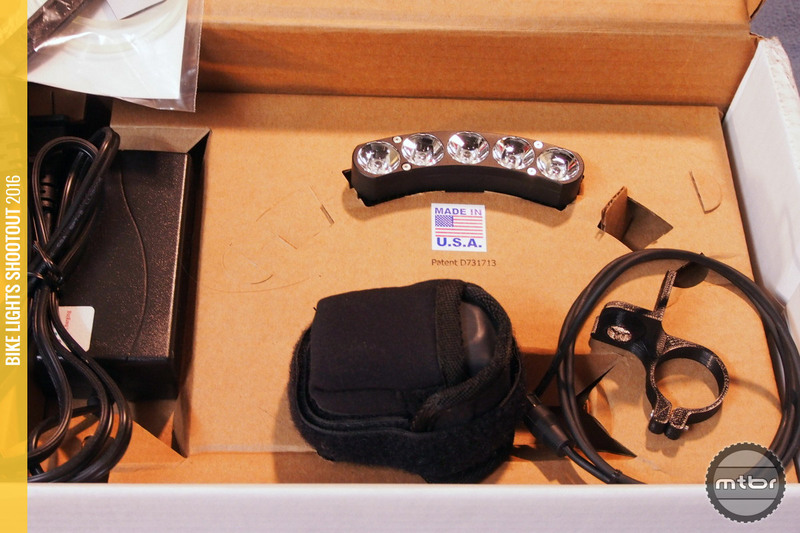 The Trail LED DS is the happy medium light hitting 3150 measured Lumens. Although some might claim this amount of light as excessive, there is a 6000 Lumen model in the line that puts this light in perspective. If one wants to ride at very high speed and if one just wants to use one light, this DS is ideal. The form factor and shape is just right with 6 LEDs in a curved row. This forms kind of a halo around the helmet and is shaped to follow the curvature of most helmets. This gives the light a low profile, as it is just a couple centimeters above the helmet. It just seems like a dialed solution for helmets for someone who wants a very bright light with long runtime. $550 for a light that may break during a crash. A light that is a bit extreme. Yes I agree the higher the output of light the better for those who are blazing away but 3k lumens and another version at 6k? I guess if you live out in the boonies where there’s no city light pollution. I ride at night but not enough to justify this. Or any $500 light. This is definitely for a specific demographic of MTB riders with DEEP pockets. Any light may break during a crash. 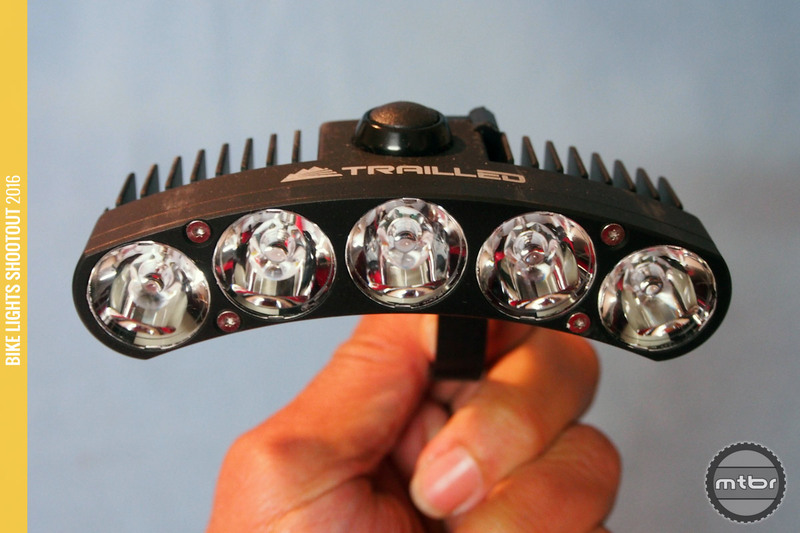 TrailLed has an excellent warranty return policy but even before you get to that, the higher lumens provides better visibility lowering the chance for a crash. I’ll keep the pair of Cree style in the pack for venturing within the city parks and road rides. After having ridden off-road with less lumens/less expensive lights while sharing the dirt with TrailLed users, I’m going to say they make a damn good excuse to spend the money. How did such a large light fit in the port of such a small integrating sphere?